Is “context” -- the content of an ad in relation to the content of the Web site it’s placed on -- a lost art when it comes to programmatic buying -- or more specifically, audience-buying? A new report from Millward Brown Digital, a company that specializes in helping Web publishers grow their brand image, suggests that programmatic advertisers sometimes “ignore” place, or context. 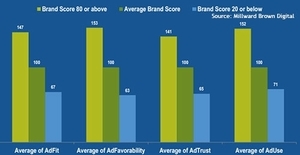 According to Millward, as the “Brand Score” went up, so did the fit of advertisements, the consumers' enjoyment of the ads, the trust consumers placed in the ads and the usefulness of the ads. Millward based its ratings on behavioral and attitudinal data collected about the consumers that visited the 44 sites during February 2014. Of course, these findings might help Millward Brown Digital, but the buy-side’s behavior suggests the company has a point. According to [x+1], a demand-side platform (DSP), buyers are not ignoring context when running audience-based campaigns. In fact, context is becoming more important. Now back to the opening question: Is context a lost art when buying audiences via programmatic? The ultimate answer is no, context is not a lost art in programmatic. Some marketers do ignore it when buying audiences, but not many. According to Carreiro, “nearly 100%” of the campaigns [x+1] sees take context into account. After all, isn’t programmatic all about reaching the right person, at the right time, in the right place? 1 comment about "Putting Programmatic In Context". Scott Portugal from Yieldbot, June 26, 2014 at 9:19 a.m.
Smart buyers aren't just embracing context - smart buyers are expanding the definition of context to look at environmental attributes of each page. Number of ads per page, where on the page the ad is relative to the content, the sentiment of the content....all of these and more define the most important question of all once you move beyond the cookie: is that ad call, on that page at that moment, the right environment for the brand? Good platforms (like ours here at PulsePoint) unlock that data and are improving both transparency and yield for both parties involved. Transparency & environment are the real bridges that will move RTB well beyond the cookie and CPM's up to fair market value for all involved.